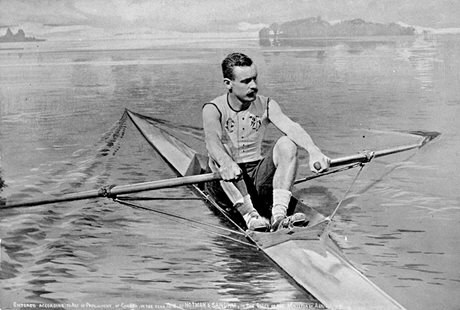 One of Canada's greatest oarsmen, Ned Hanlan (1855-1908) was born in Toronto. As a child, he took up rowing when his family settled in the vicinity of what is now known as Hanlan's Point on the Toronto Islands. Although standing only 5’7” tall and rarely heavier than 150 pounds, Hanlan became a leading international sculler. In 1873, he won the amateur sculling championship on Toronto Bay. Becoming a professional in 1876, Hanlan defeated all opponents in the Philadelphia races that year. He overcame all leading North American competitors and, in 1880, won the world single sculls championship in England. Hanlan retained his title until 1884. A popular Toronto figure, he was elected alderman in 1898 and 1899. Visit the Ontario Heritage Trust provincial plaque near the ferry dock at Hanlan’s Point, Toronto Islands, Ontario. See images of Hanlan from 1878-79 on the Library and Archives Canada website. Learn more about Hanlan on the Hanlan Boat Club website. Read an article from the Torontoist on Hanlan: The People’s Champion.